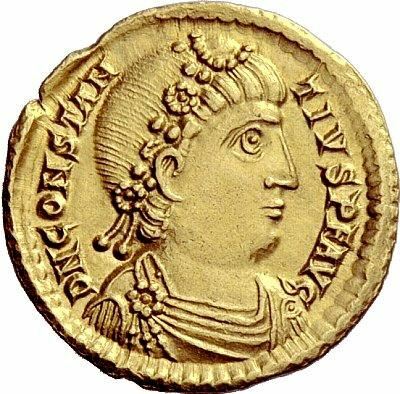 Flavius Constantius Augustus as Western Roman Emperor for seven months in 421. A prominent general and politician, he was the power behind the throne for much of the 410s, and in 421 briefly became co-emperor of the Western Empire with Honorius. He married the sister of Honorius & Arcadius - Galla Placidia - and had two children with her, and on the 8th of February 421 AD he was proclaimed co-emperor to his useless brother-in-law, Honorius. He was organizing a military expedition to the East to have his rights recognized when he died suddenly on September 2, 421. His son would eventually rule as Valentinian III.